If you would like to donate food but are not in our area, you can do so by ringing our supplier on 01283 810137, who takes payment over the phone. 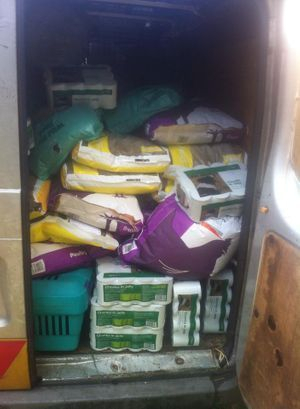 Please mention the food is for Burton Wildlife Rescue; We will collect it from the store. Cat and dog meat is around £6 for 12 tins. Our animals are fine with the cheapest tinned food. Funds to help purchase food and fuel for rescue activities can be sent via paypal [email protected]k (registered to Burton Wildlife Rescue). Cheques: Please make payable to 'Burton Wildlife Rescue' and send to 15 Lincoln Road, Stapenhill, Burton on Trent, DE15 9HP. Support Burton Wildlife Rescue And Animal Centre for free when shopping online with over 600 popular retailers, including Argos, Amazon, NEXT, M&S, John Lewis, Debenhams, HMV, Vodafone, DELL, The Body Shop©, PLAY.com, Interflora, Comet and many more. Just register and log in everytime you want to shop. By going to the websites via the links on this site a donation will be made to us when you purchase something.